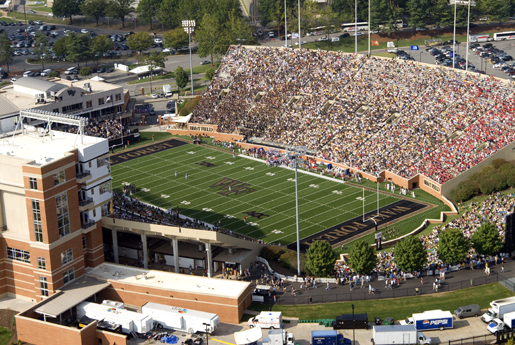 Originally built in 1968, Wake Forest's BB&T Field is the home of the Demon Deacon football team. With a bleacher capacity of 31,500 plus several thousand more behind the endzones, BB&T Field offers an intimate setting with fans right on top of the action. Considered one of the most beautiful stadiums of its size in the nation, BB&T Field has undergone significant renovations in recent years. Prior to the 2005 season, the facade along the sidelines and south endzone were re-faced with approximately 89,000 bricks, specifically created for this project by Pine Hall Brick Company. The bricks are in the same style of those that adorn the buildings on Wake Forest's Reynolda Campus, less than a mile away. In 2006, a state-of-the-art, "next generation" FieldTurf surface was installed to give the Deacons a top-notch and beautiful playing field year round. In January 2007, construction began on Deacon Tower, a massive seven-story pressbox that is situated on the west side of the stadium. Deacon Tower, which was built at a cost of $48 million, houses luxury suites, club seats, boxes for the University President, home and visiting athletic directors and print and electronic media. Construction on Deacon Tower was completed in August 2008, and the facility has since served as the centerpiece of the football stadium complex. Also in 2008, several new seating options became available to fans. Chairback seating was installed in a portion of both sides of the stadium, and temporary bleachers were added behind the north endzone, offering unique group seating opportunities to Deacon fans. On Oct. 8, 2011, Wake Forest added a state-of-the-art video board to the South end zone. The board measures 42 feet in height and 90 feet in width. It contains over 1.5 million pixels and 3,780 square feet of active video area. Prior to the 2009 season, the east side concourse was completely remodeled with new bathrooms and concession stands. Behind the north endzone sits Bridger Field House, which serves a number of purposes for the Wake Forest athletic department. Built in 1998, Bridger Field House houses the home and visiting team locker rooms, postgame interview room, specific areas for equipment and sports medicine staff and the Deacon Shop on the first floor. The offices of the Wake Forest Development, Sports Marketing and Ticket Operations are also housed in Bridger. Dedicated as Groves Stadium on September 14, 1968, in a 10-6 loss to rival NC State, BB&T Field represents an extensive fund-raising effort undertaken by the college during the mid-1960s which, for all practical purposes, made possible Wake Forest's continued membership in the Atlantic Coast Conference. The stadium, which has 31,500 permanent seats, is located between Reynolds and Deacon Boulevards, one mile from the Wake Forest campus. It also is part of the athletic hub of Winston-Salem, which includes the Lawrence Joel Veterans Memorial Coliseum, home of the Demon Deacon basketball teams and located across the street from BB&T Field, as well as Wake Forest Baseball Park, home of Deacon baseball and adjacent to the football facility. The history of BB&T Field can be traced back to the original home of the university in the eastern North Carolina village of Wake Forest. When the school announced its planned move to Winston-Salem in 1948, the Groves family, led by Henry (the original stadium's primary benefactor) and his brother Earl, made an additional financial commitment to insure that their family name would remain on whatever new facility that the football program would construct. The new stadium, however, remained only a dream for nearly two decades. The actual cost of the campus' relocation to Winston-Salem was much greater than first anticipated, and more pressing physical needs in academic areas took precedence. The Deacons had scheduled frequent dates in Winston-Salem's Bowman Gray Stadium in the years preceding the college's move and made that 16,000-seat facility their permanent home in 1956. Winston-Salem philanthropist Charles H. Babcock donated a 77-acre plot of land for the building of a new stadium, but each time that the project seemed on the verge of becoming a reality, other needs would emerge. Finally in 1966, a fund-raising campaign was initiated. And while the $1.5 million raised was less than half of the total price tag, construction began the following year. After dropping its opening contest at BB&T Field to NC State, the Demon Deacons played Clemson to a 20-20 tie the following Saturday, September 21, 1968. That contest also marked the first televised football game in Wake Forest history, as ABC broadcast the game as part of its regional package. Wake Forest's first victory in the facility had to wait until after three-straight road dates, when on October 26, 1968, Wake defeated North Carolina, 48-31. The Deacons have turned in two undefeated home seasons in BB&T Field history. Wake Forest was 4-0 at home during its ACC Championship season of 1970. The 1979 squad improved that figure by one win to a 5-0 mark on its way to a Tangerine Bowl bid. One of the most dramatic BB&T Field victories also occurred during the 1979 season when the Deacons rallied from a 38-20 halftime deficit to defeat Auburn, 42-38. That game marked the first time that two nationally-ranked teams met at BB&T Field. In 1990, a BB&T Field milestone of sorts was reached when the University of Virginia became the first (and still the only) No. 1-ranked team to appear there. 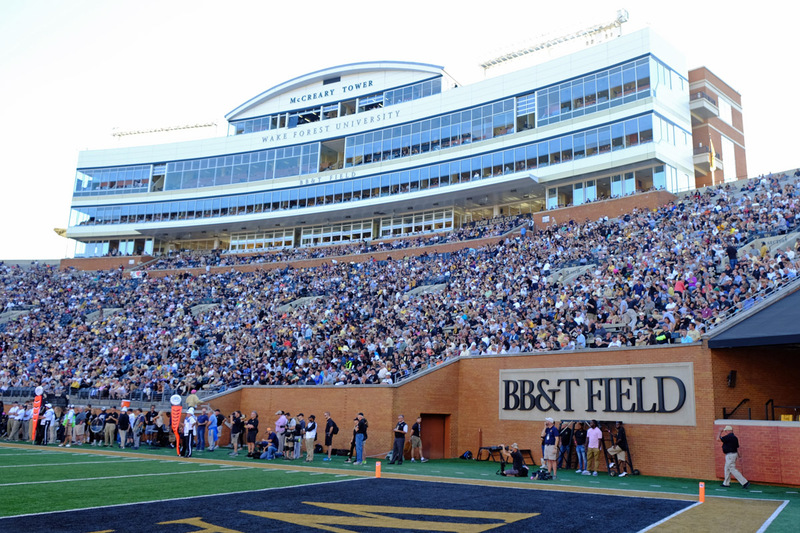 Wake Forest broke its single-game attendance record at BB&T Field in 2004 when temporary bleachers were installed for the North Carolina game, attracting a crowd of 37,623. The Deacons have recently been among the national leaders in attendance as based on percentage of capacity. Wake Forest averaged better than 100 percent of capacity each year from 2006 through 2009 and also in 2011. The Pruitt Football Center serves as the on-campus home for the Wake Forest football program. Fully renovated in 2004, the facility houses the coaches offices, the team locker room and team meeting rooms and is adjacent to the Doc Martin Football Practice Complex. Visitors to the complex are greeted with a beautiful glass case that contains trophies from many of the team's accomplishments, including the 2006 ACC Championship trophy. The main floor houses the office of head coach Dave Clawson, as well as a large video editing suite and a room designed specifically for NFL scouts where they are able to gather player information and watch film. The team's spacious 3,500 square foot locker room is also located on the main floor of the complex. The locker room is filled with individual solid oak lockers and an equipment area, which houses each players' full football gear. Directly outside of the locker room is a comfortable players' lounge with two flat screen high definition TVs and black leather sofas. Team members will often come here to relax between meetings or classes. The focal point of the complex's second floor is Decker Auditorium. This 1,500 square foot team meeting space features 130 black leather seats, each embroidered with the Wake Forest logo. Surrounding Decker Auditorium are the offices of each member of the football coaching staff. These offices are adjacent to their own position meeting rooms which offer state-of-the-art video systems. The Demon Deacons also enjoy the convenience of practicing in the heart of Wake Forest's campus, right outside of the Pruitt Football Center. The Doc Martin Football Practice Complex, which was dedicated to Louis "Doc" Martin in 1989, is just steps away from the team's locker room. The facility's namesake Martin served as the athletic trainer for all of Wake Forest's athletic teams from 22 years from 1958-80. The practice facility has three fields. The main field is artificial FieldTurf, which allows the Deacons to practice on the same playing surface as BB&T Field. The two side fields are natural grass. Located adjacent to the practice field is a sports medicine area where trainers can immediately tend to injured players. 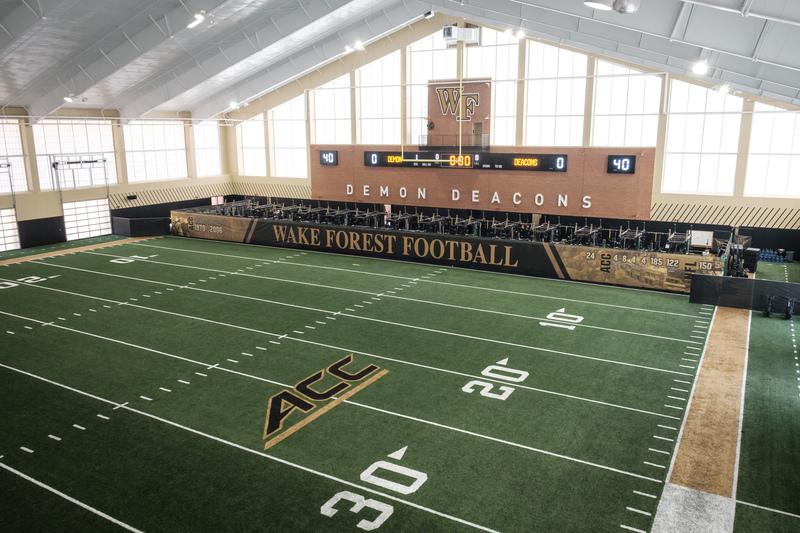 McCreary Field House, the new indoor practice facility for Demon Deacon athletics, opened in the spring of 2016. 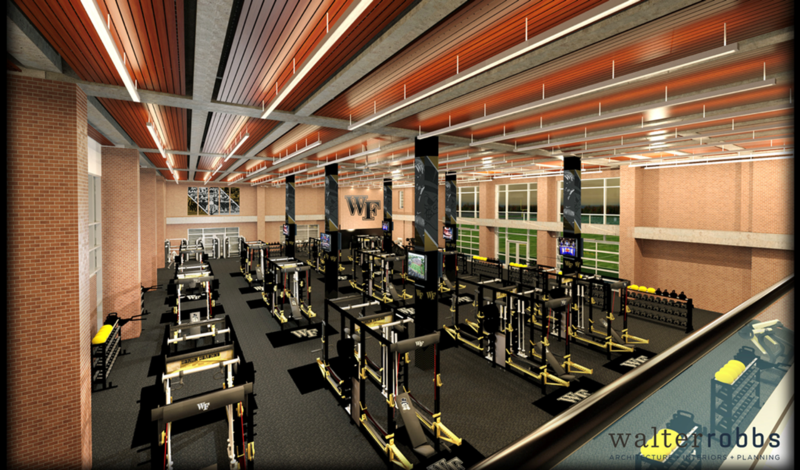 The 80,000-square foot structure features a 120-yard football field and weightlifting facilities for the Wake Forest football team. McCreary Field House is the first phase of a planned $58 million project that will include the Sports Performance Center. The Field House was constructed at a cost of $21 million with Bob McCreary providing $12.5 million as the lead gift on the project that was totally funded through private gifts. Located behind Miller Center on Wake Forest's Reynolda campus, McCreary Field House is designed to benefit all 18 Wake Forest athletic programs. It will provide an area for teams to train year-round regardless of the weather conditions. McCreary graduated from Wake Forest in 1961 and played football for the Deacons. He grew up in rural Caldwell County, N.C., and regularly credits the scholarship that provided him the opportunity to receive a Wake Forest education and enabled him to succeed in business and in life. After a brief professional football career, McCreary worked for 20 years in sales and marketing in the furniture industry before founding his own furniture company, McCreary Modern, in 1986. McCreary Field House is roughly 200 feet by 400 feet with a peak height of 72 feet. Including site work, the entire facility was constructed in 18 months. The playing surface is an exact replica of the surface at BB&T Field, Wake Forest's home football stadium. The surface matches BB&T's surface in terms of appearance, pitch and playing turf. The South end zone area is currently occupied by a 7,000-square-foot weight room that gives the football team a dedicated training area. All of the weight equipment will be moved to the Sports Performance Center when that facility is completed. McCreary Field House features goalposts that are suspended from the ceiling and can be raised and lowered depending on the activity. Camera platforms are provided 28 feet above the playing surface to facilitate videotaping of practice activities. The facility consists of 240,000 bricks, 543 tons of steel on the overall super structure and 95,000 square feet of standing metal seam roofing. Over 125,000 man-hours were invested in the construction of McCreary Field House.